The newest and hottest Warren MI car wash is already a fact! DetailXPerts of Troy-Warren started operations a couple of months ago, but its official grand opening ceremony is planned for early August. What’s unique about it, besides the DetailXPerts patent-pending steam technology, is its owner. The young and ambitious Crystal Wilson has experience in the automotive industry, which serves as the perfect background for building up a car-and-truck business of her own. Simple car wash belongs to history. Technological advancements combined with care for the environment pave the way to the future of this field. At least since DetailXPerts’ model was conceived and put into action. The use of steam power, biodegradable materials, and less than a cup of water to detail an average-sized automobile has been fascinating clients for over a decade now. Additionally, the impeccable results on the outside and the removal of up to 99% of bacteria and sickening microorganisms on the inside can easily explain why thousands of customers all over the USA have become firm and loyal fans of the company’s services. And it is exactly this concept that is now available to both residents and businesses in Troy, Warren and Sterling Heights thanks to Wilson’s vision and entrepreneurial spirit. With a BA in Communications from the University of Michigan and over 10 years of experience in building and leading projects from conception to completion, Ms. Wilson was looking to a bright career in marketing. Her rich record of accomplishments at General Motors cannot but promise the best to the dynamic professional she is. Yet, a shiny career was not sufficient for her. She wants to make a change, to have an impact on her community, and help others provide for their families and have a better financial future. Therefore, she started looking at business opportunities, analyzing and comparing their business models, growth potential and profit margins. In the course of time she turned down more than 10 options before she finally met the DetailXPerts one. At this point, this Buick Brand Communications Manager decided to continue her work in the automotive field from a different perspective. 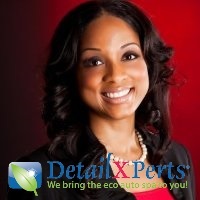 So, she opened DetailXPerts of Troy-Warren, the hand car wash that takes care of vehicles, drivers and passengers, and nature. It should have already become obvious why Crystal Wilson’s Warren MI car wash will succeed. Are you ready to follow in her steps? Contact DetailXPerts today to find out how you can change your life, your future, your community, and our Planet! Found this article interesting? Sign up for our monthly newsletter to stay updated on all things franchise!